It is a bare truth that nothing can ease the pain when someone dies in a family. However, moral support and consoling gesture can help your grieving friend to know how much you care for him or her. If you want to send a gift but don’t know what to send when someone dies, following some important customs can be beneficial for you. Your concern and care can be a pain balm to the burning heart of the bereaved. A gift can be anything when you give it to your dear and near ones. But crematorium ceremony is alien to other occasions. You should show love, care and concern through the medium of the condolence gifts and sympathy cards. So, you need to know what to send when someone dies. If the gifts are thoughtful and memorable then you have a perfect choice. Whether the gifts are expensive or inexpensive, your concern and care should be altruistic and generous. You can provide such gifts that are framed with the reminiscence of the demised person. Send the gift with sympathy card or touched note in the name of the demised and the family. Try to send the gifts within two weeks after the death because this can be consoling for the bereaved and the family. The gifts must be wrapped in a white cover that denotes the message of peace and purity. Follow the religion and customs while sending religious condolence gifts and try to consult in church before purchasing a gift. If you are sending money then send the cash or cheque covered in an envelope with a sympathy message in the name of the demised person and his or her family. Gift of service may also help the family of the bereaved, so try to take special care of the bereaved and their family. Giving attention, timely food and moral support to your grieving friend can be helpful. Organizing the crematorium ceremony of the demised person can also be a special gift to your bereaved friend. Your time, care and support can be more precious than any other expensive gifts or money offered to the bereft friend and family. Always remember that your soft-spoken consoling words can heal the pain of the bereaved and gifts are only the medium to show concern. Offer a generous gesture of care to your grieving friend with profound consoling message and sympathy quote in a sympathy card. Kind words can be the best healing way during the mournful situation. So, expressing your love and care with a soothing message via sympathy card can act as a comforting ointment to the deep cut in the traumatic situation. White and light color flowers are a symbol of peace, purity, solace and love. You can offer flowers in the memory of the demised person in the death ceremony. You can also send the fresh flowers with consoling message to your grief-stricken friend if you are far away from him or her. Flowers have the special quality to spread fragrance and help an individual to forget the agony for some time. It can also be used as a tribute to the graveyard of the deceased person with prayer. During the mournful situation, the bereft and family ignores their health by skipping food. If you are a true friend of the person always try to gift foods like sweets or a basket of gourmet food. You can also order lunch or dinner for the family because people avoid cooking in such a traumatic situation. You little concern can breeze out the burn and make the mourning person feel eased. 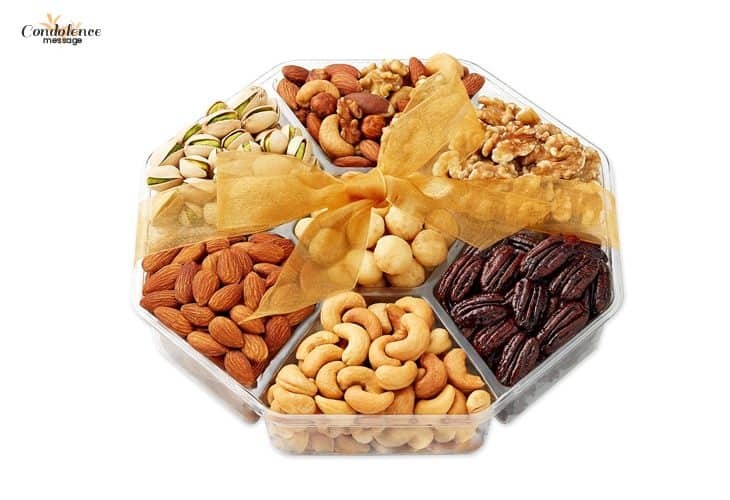 Sometimes, when you are going to a crematorium ceremony, you can carry a dried fruit & nuts tray with you with flowers or condolence card. This type of gift can be a token of love and care that you want to express. You need to make the mourning family understand that ignoring their health can make the situation more adverse, so they should have food on time. A memorial tree on the honor of the deceased can be one of the best sympathy gifts for your mourning friend. A tree on the reminiscence of the demised person may cherish the memories of the person. When the tree grows up, the fragrance of the blooming flowers and sweet fruits will help the family of the deceased person to recall his/her sweet memories. Books can be a selfless friend that only gives knowledge and lesson if you take it positively. If the bereaved person is a good reader, you may help the individual to come out from the situation by presenting religious books, memoirs, poetry & quotes and moral short story books with the positive lesson of life to overcome the adverse situation. These types of books may help your friend to fight with the terrible moment of life. 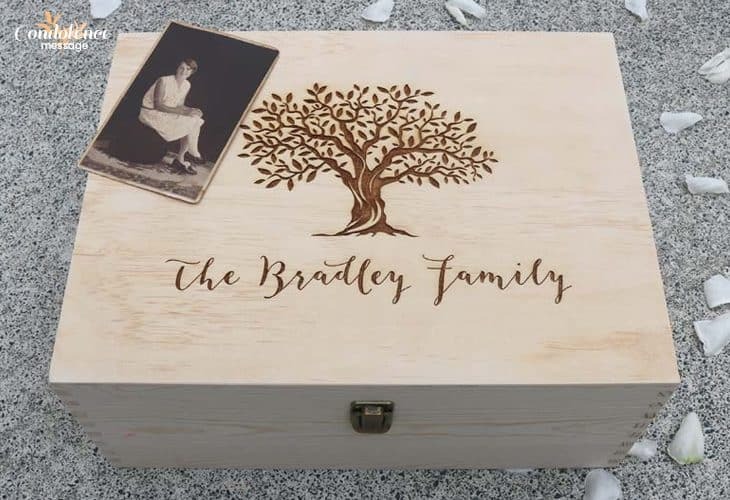 A remembrance keepsake box or memory chest may help a bereaved person to keep the memories of the demised person stored forever. The box can act as a place to store the soil of the graveyard of the departed person. It can store the portrait, pictures, paintings and poems of the person who has departed. This may help the bereaved and the family to recall the person’s memory for a lifetime. Generally, memory quilt is created with the old clothes, handkerchiefs and materials linked with the deceased person that hold important value for the family. Try to collect those things and order your nearby tailor to create a memory quilt in the name of the deceased. This can be a special consoling gift for your bereft friend because special memories of the dead person will be always with the family. The quilt will make the mourning person feel the presence of deceased forever. People use to keep the portraits or paintings of that person who have passed away. So, you can find out a talented local painter who can paint a beautiful portrait of the deceased. This portrait can be one of the finest gifts for the family of the bereaved because it will help them to remember the demised person and he or she will always be alive among them through the portrait. You can collect multiple pictures of the demised with the family and stuck them with notes in big cardboard. Handmade collage pictures can be the lovely condolence gift that highlights the memory of the deceased. You can also buy a photo frame and give that to the bereft by adding a beautiful picture of the deceased person. These types of gifts are always special because they keep the dead person alive with the photographs. A memory jar can be a touching gift, which can be used in different ways. You can fill the jar with some memories such as keepsakes, notes, poems, pictures and drawings of the deceased. This keepsake jar can be handmade and simple. 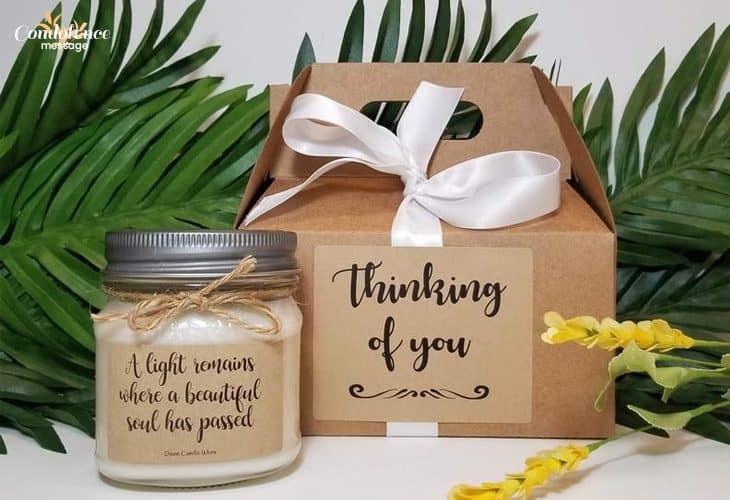 You can also add sympathy message in the jar and offer the gift to your inconsolable friend by the name and memories of the special person who is no more. Memory jar is a simple gift but an emotional and touching reminiscence of the demised. The charity or donation on the name of the deceased can be the great gift because it will give peace to the soul of the demised person. You can donate an amount at the orphanage, old age home, church etc. This will not only give solace to the demised soul, but also fill your heart with satisfaction and contentment. Suppose your bereaved friend has some financial problem, try to stand by the side with financial support. You can send money via cash or cheque in an envelope with a sympathy or consolation message. This gift may help an individual to fulfil the needs of the family. Your financial support can be the best gift for the person during a hard time. If the person is unwilling to take your help, still you need to support him or her during this pathetic moment. Rather than expensive gifts, the family of the bereaved need care and honest support. Try to cook foods or take care of the children of the grieving person in an adverse situation. Care, sympathy and support are the only medicines that can heal the pain of the person who has lost an important person forever. So, it is your prime concern to give your moral support in that tragic situation. During the mournful time, the Heavenly Father can only help the bereaved person and the family to get away from the pathetic condition. 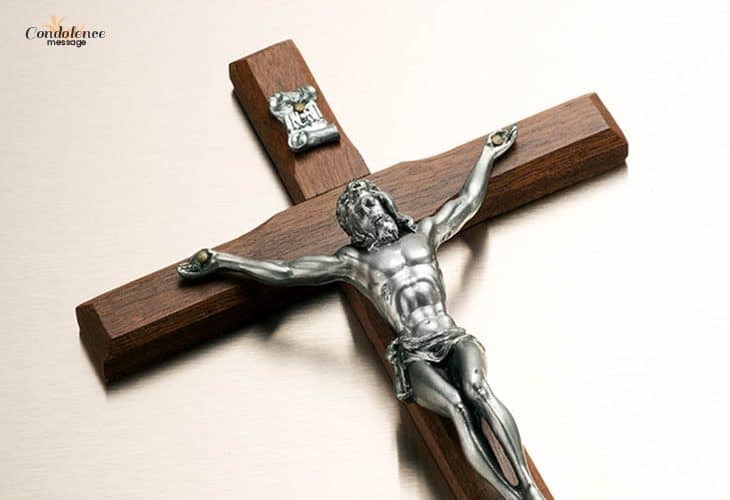 So, you can give a statue of Jesus Christ, a Bible, a religious Wheel Champ, and Stoneware Wall Cross. Prayers on the name of demised, chanting the name of Christ and reading religious books can endure power and peace in the heart of the bereaved and family. Religious gifts can heal the aching heart of the bereft by enduring forbearance. A candle with a special sympathy message about eternity can be a good gift for your bereaved friend. This candle symbolizes comfort, warmth and healing. With the burning flame of the candle, the memory of the dead person will be eternal in the heart of his/her family. So, make the deceased alive with the flame of the candle in the hearts of everyone. You grieving friend may like to spend time in the garden or backyard. 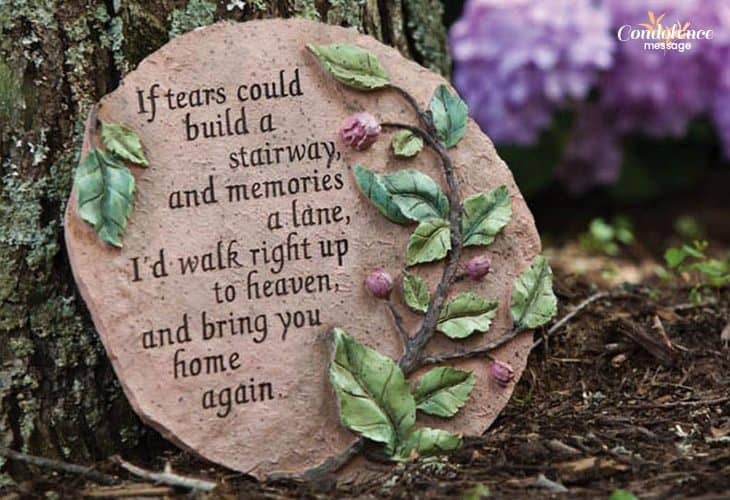 Giving a memorial stepping stone can be a good gift to be kept in the garden. You can print a message like “People we love never go away”, and “You will always be in our hearts”. This kind of special gift will make your friend remember the deceased person while visiting in the garden and the name of the departed person will always be in the memory of everyone with love and solace. 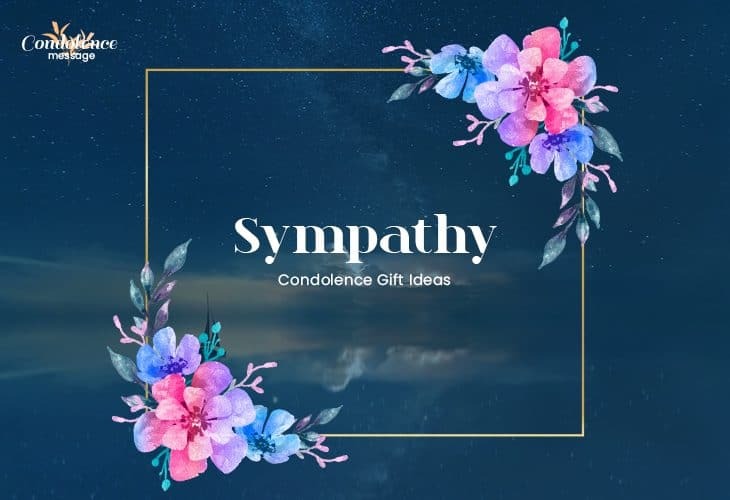 Personalized gifts like wind chimes imprinted on the name of the deceased, personalised pendant with the name and pictures of the demised, customised heart shape bowl in with a condolence message and personalized coasters are some of the special customized sympathy gifts you can send to your gloomy friend. Customized gift always has special touch because it is made on the name of a specific person. So, try to make the personalized gift framed with an emotional touch for the bereft. A willow tree statue is imprinted with messages such as, “Forget me not”, “Our Angel is in Heaven”, “May God bless you”, etc. Therefore, gifting a willow tree to your grief-stricken friend is not a bad idea when someone special is no more in the family. The willow tree is a sign of reminiscence on the name of the departed person who will always be in the heart of the inconsolable family. What is the appropriate time to send the gifts? During the day of crematorium or between the two weeks of the death, the sympathy gifts should be sent whether you are near or far from the grieving friend. Do not send the condolence message or gift after one or two months because it will show that you have less affection for the deceased. Sending a late gift can show less affection and care to the mourning person and the family. Always remember that your bereaved friend will never forget the kind gestures and compassion you convey to him or her. Standing in the difficult phase with someone during his/her mournful situation can be the best support. Who should Receive the Sympathy Gift? Sometimes after visiting a crematorium ceremony or at the funeral, we give the gifts to the person who is not the closest relative of the demised. This is the wrong way to console your grieving friend, neighbor or relative. You should give the gifts to the family member of the deceased. You may also donate funds or charity on the name of the deceased to an orphanage or old age home. Undoubtedly, it’s hard to face a mournful situation but you have to visit the crematorium ceremony to console your bereft friend or relative. Carrying a condolence gift can be an honest care and concern that you want to show. Reading this article may give you some ideas to comfort a bereaved person with a message that you are always with his or her family in the bright and dark part of life.